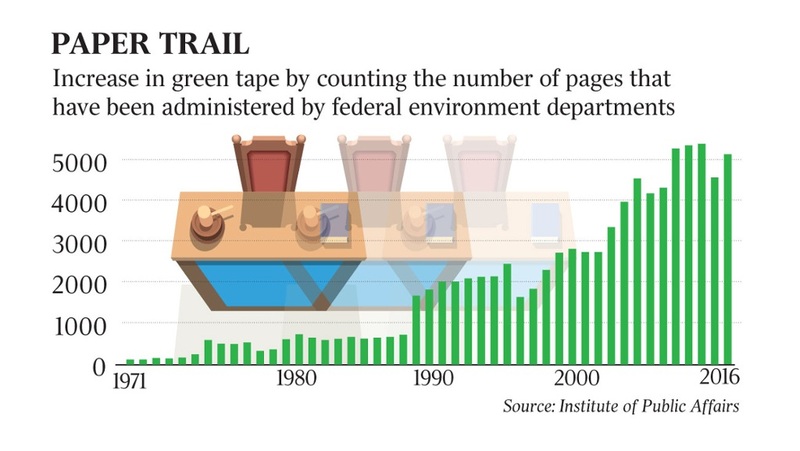 Thanks to the IPA we can see just how fast green tape multiplies. In 1971 the first environmental laws covered just 57 pages. But now there are 4669 pages of laws. The IPA estimates that costs the nation $176b a year in lost economic opportunity. That’s a lot of jobs, and a lot of trees. *Apologies $176b corrected to million. The Adani central mining project application has been running for seven years and faced more than 10 court challenges. It includes a 22,000-page environmental impact statement. In the Pilbara in Western Australia, the Roy Hill iron ore mine had to obtain 4000 separate licences, approvals and permits just for the pre-construction phase. The Turnbull government vowed to review environmental laws to prevent activist groups’ legal challenges to development projects ranging from dams and roads to coalmines. It said challenges under section 487 of the Environment Act, which allows anyone with a “special interest in the environment” the right to challenge, were becoming more “vexatious and frivolous” . Of 32 legal challenges under the act that went to court, developers spent a cumulative 7500 days — or 20 years — in court even though 28 of the environmental cases were defeated and three required only minor technical changes to go ahead. Government propaganda also deprives citizens of a meaningful, joyous life of continuous discovery. Fifty-six years ago, in 1961, President Eisenhower warned that a “scientific-technologically elitist“ group might take control of our public research agencies in order to take control of government policies. That is how the US National Academy of Sciences guided US policies to support the UN’s Agenda 21. This is self-inflicted wealth destruction. Societies need an “opportunity costs” approach. Move faster, do better, stop wasteful practices. When the global warming folks say.. The problem is the silent majority. We let these idiots get away with everything. John. You may not be an Australian. So I tell this. “Greens” have never held a really significant share of the vote in Australia. But they (and some other fringe dwellers) have often held the balance of power in one or both houses of our parliaments, where neither mainstream party a had working majority, and depended on Greens support to get legislation passed. With this system in play, the Greens have held power far beyond their electoral support. Neither major party has ever had the guts to tackle them head on for fear off losing to the other major party. Indeed. I live in the Great State of Washington. It is also a ‘blue’ state and seemingly ever Green, and needs no help in pushing bad policies. However, I live on the dry side and it is noticeably not green, except in spring time. Its a confusing world for the masses to try and understand. If it happens then they need to be afraid of things that go bang in the night. Well good on Charles Moore! It’s a good article by Charles Moore. I was really pleased to read it. It’s long past high time. My mother lives in Buckinghamshire, but, until a few years ago, she was in Cumbria. That’s not a big distance, in Australian terms, but quite a change. Where she used to complain that it never stopped raining in Cumbria (pretty nearly true), now she wishes it rained more often. Luckily, one thing hasn’t changed. A short walk will give her a fabulous view of the local wind farm. Back in quiet Cumbria, she experienced the constant hum of the wind farm up the valley. A couple of miles away, you can face north and count the wind turbines carpeting the Cumbrian fells, or you can turn south and just pick out Heysham nuclear power station, the other side of Morecambe Bay. I think I know which one of those energy sources is more dependable. Nuclear power itself is more expensive than it needs to be, largely for political reasons, but all those wind farms are a complete waste of money. In the part of England where I live, there are quite a few big arrays of solar panels. Yes, we probably get more sunlight here than they do in Cumbria, although the British summer is famous for a reason. Neither those solar panels nor the wind turbines spoiling the landscape in Cumbria, or in Scotland, or off the coast of Norfolk will ever be cost-effective. They will make money for the generating companies, until the subsidies run out, but they make no true economic sense at all. They mean unreliable power, ridiculously expensive and doubly so for needing to be backed up by some alternative source, to stop the lights going out. It’s insane. I remember seeing some television documentary that argued that it was statistically certain that the entire universe was actually some gigantic entity’s lab experiment. When I look at the idiots who have been trusted to make decisions regarding British energy generation (Blair, Brown, Miliband, Cameron, Huhne, Davey, Rudd…), I think that programme may have been on to something. That’s one I haven’t heard befor, green tape. I’ll have to remember it the next time I’m commenting to someone about environmental regulation. I wonder what it’s costing us here in the states. And frankly it’s scary to think how much money is going down the drain along with the money well spent on something actually useful — and some of it is well spent without doubt. And I lump together the maintenance of National Forests and other things we’ve been doing for years, like cleaning up landfill operations to prevent undesirable things from getting into the ground water. Example of the problem: My house and the whole tract sits on lake bottom clay so water soaks in only slowly and any good rain builds up puddles that hang around, sometimes a day or more depending on the storm. One Saturday morning I got up after about 12 hours of steady heavy rain and my whole back yard was a lake and within about an inch of coming up onto the patio. I had to run quickly and open the gate to relive the problem because all sorts of debris had piled up under it, blocking the water’s path to the street. Close call. The rain didn’t end for about another hour. It’s literally a possibility under regulations still in place for the EPA to come along and declare my yard a wetland and lock me (actually my wife who is the gardener) out of any legal possibility of so much as cutting the grass or pulling weeds from the flower beds. I don’t think the EPA will be quite that unreasonable but they have done some stuff of similar nature and there is no recourse. Maybe Trump… But he hasn’t yet. And that leads to a question. Why is a wetland intrinsically valuable? Some are and some really are not. But they get equal status as something needing to be protected. I think that goes for the swamp called District of Columbia that Trump has vowed to drain. Why is it valuable? All it’s been worth lately is trouble. We had a wetland back when my city was discovered it was originally named “Black Swamp” then later “Yuille’s Swamp” until it was dredged and cleared becoming “Lake Wendouree” which is now one of the cites biggest assets for tourism, recreation, sports. If any green tape had existed back then then we would still be looking at a shallow pool of stagnant water full of reeds and dead trees, our council loves to tout its environmental green policies but fail to see how development can enhance a region bringing quality of life to all its inhabitants. ” until it was dredged and cleared becoming “Lake Wendouree” “……….and made much larger than it originally was to create the rowing course for the 1956 Olympics. Yonniestone. A man in my own city! And what a wonderful asset Lake Wendouree is! So much better than a swamp. Last time I was in Ballarat the lake was basically totally dry. And in good old Victoria a wetland created by humans is sinful. A wetlands is a poetic way of saying stinking bog. So naturally the greenies all love it. I wonder how they would determine that original wetland condition, which was certainly a lake of extent unknown to me. I wonder even more how they would deal with 2 or 3 hundred angry homeowners, minimum. But yes, that’s the absurd length they can go to if they want. I believe this is the same case I read about but I’m not sure. However and in any case, it should be an easy determination made by inspection whether a wetland is in fact part of a watershed that does deserve protection. And you should be able to get that determination made up front before you sign a single piece of paper or put as much as one red cent into the purchase arrangements, not after you start to build. And that’s the the trouble with government — they either can’t or won’t tell you before anything is started, exactly what they will and will not allow… …and then stick to it because an agreement with a government agency should be the same as an agreement with anyone else. But government agencies believe they’re invinceable, unchallengeable and king of the mountain. They have forgotten who they work for. And to top it all off, there’s no good reason to believe any groundwater around here would be suitable for drinking. Too many homeowners have been putting pesticides and fertilizers on their yards for a long time. I wish that had been better controlled and managed but it happened and we now have better things available to use. Even watering with tap water is a problem eventually because that water contains dissolved minerals, mainly calcium and magnesium carbonate, and that stays in the soil when the water evaporates and eventually you can’t grow much in it because of the buildup of those salts. Dear me, Roy, you’ve never heard of “green tape”? Thank your lucky stars, mate, if you have never had to deal with it. In the latter years of my career as an exploration geologist I was running a small publicly-listed mineral exploration company and dealing with “green tape” was one of the reasons that I was really, really glad to retire at the age of 65. The amount of bulls**** that environmental compliance requires has to be seen to be believed. Just before I retired we were dealing with the early attempts to control ‘pollution’. This consisted of a ‘fishing expedition’ to find out what was going on out there in industry. We were faced with a sub-committee of public servants who wanted all sorts of figures on releases of gases (including CO2), solvents, ingredients of waste water etc. The biggest problem was an arrogant middle ranker (who was working the contractor rort) who believed he knew best, when in practice he knew s.f.a. (Eventually the companies involved put in a combined complaint about him). One example was he wanted samples from our after-burner which took solvent fumes from the factory and exhausted them as hot gases (including CO2) up a tall metal stack. There were steps spiralling around the stack but no-one ever went up them as it was about 200℃ at the base, and the ‘sample point’ was 3 turns and about 20 metres up. He demanded (no other word described his attitude) that a series of samples be taken (hourly if I remember) to which the factory manager said “collect them yourself”. As for the solvent fumes he thought were somehow not going up the exhaust he wanted measurements inside the factory using a choice or 3 methods. I had to look at the cost of continuous real time GLC sampling at a minimum of 20 points – and that was the least stupid of the ways offered. Eventually an engineer constructed a huge Excel spreadsheet of 64 pages (with over 2000 rows) where formulae were spread over multiple pages and an answer appeared on the front page. Even he had trouble figuring out how it worked, if it did, but the public servants were delighted – they had figures to put into reports. Whether they were correct they had no way of telling and there was no way to debug the spreadsheet under about 2 weeks or more of solid work. They insisted all the companies being surveyed do like wise, which was easier for the companies when our engineer tipped them off on how to modify his. I haven’t mentioned the State nor the industry involved because I was told a few years ago that this B.S. was still being fed to the public servants, State and Federal as the basis for their decisions. Best to let them keep thinking that there are in control. I haven’t mentioned the State nor the industry involved because I was told a few years ago that this B.S. was still being fed to the public servants, State and Federal as the basis for their decisions. I wonder just how much of this is actually going on, especially from Senior electrical engineers, who are telling politically motivated apparatchiks what they can translate into what their political puppet master string pullers want to hear. For the life of me I wonder how all these people get away with saying what they do, and clueless journalists just accept it as fact, without actually finding the truth of the matter. I fear the day that the real truth actually does come out, and just what is going to happen. There they will all be, like deer trapped in the spotlights, wondering why they were not told, and the answer will be that ….. we told you. You just didn’t want to hear it. The real people will write the facts, and the apparatchiks will translate that into an acceptable version for their bosses to read. The bosses know that if it all turns to bovine waste, they can l0p off the heads of those middle men directly under them, because I can assure you, those who know the truth will have covered their a$$es so well. Graeme, your comment fits very nicely with the 22,000 page environmental impact statement mentioned in Jo’s post. There is no way that an EIS would require more than one hundred pages so what sort of landfill is shoveled into the other 21,900. It would be very surprising if anyone read more than 20 pages of such a massive agglomeration of material. Truly, the world has gone mad. You guys do realize, don’t you, that those 22,000 pages were the first draft of Obamacare? Someone just recycled it somewhere else and no one noticed. Read it? You’ve got to be kidding me. Note that that spreadsheet was a “computer model”. Dear me, Roy, you’ve never heard of “green tape”? I guess I have to plead ignorance. I’ve heard of and been through some red tape. Does that count? Every official action has to be signed in multiple copies in front of a notary public who gets to charge $10/signature and then the whole package is wrapped and bound in red tape to send off to some government office. Both the term and the rolls of red tape have been around since Adam ate the apple and then wanted special dispensation to blame Eve for it. But it didn’t work because the notary public hadn’t been invented yet. I’ve never been in the building trades, architecture or any of a long list of things where government gets involved but I had assumed the same thing, rolls and rolls of red tape needed before you could get anything done. I guess I’ll now need rolls of both red and green tape. I had a very interesting fix term position within my company. Unfortunately, I had to deal with green tape, CO2 quota regulations, in that position. I also had to deal with paranoid bureaucrats with no competence and no real understanding of the consequences of their regulation. More than that they had no respect for the unnecessary burden that they put upon workers within the field they regulated. When the term came to an end, and I had to quit that position, I felt that the only good thing about quitting was that I no longer had to deal with incompetent and paranoid bureaucrats. I think that was the time I decided that I really had to look into the basis for their regulation. I though, how could bureaucrats having so poor understanding of relatively simple things have a good understanding of the climate theory. I have always been a skeptic, but I think it is fair to say that I turned my skeptic eye on climate theory because of green tape. What I found was that the principles governing IPCC and United Nations were at best dubious. What’s stronger than duck tape? Answer, it used to be Red Tape but now Green Tape wins by a country mile (Km for the younger generation). It can tie you up for years and sometimes there is just no escape. One day I found the usual duct tape on the shelf in a big discount retail store — you’ll be able to guess the name I expect. It was the regular duct tape in every respect but the label on the wrapper called it Duck Tape. I think this proves that if you say something over and over for long enough it becomes fact, much like climate change. Just thought you’d like to know there really is Duck Tape out there. If correct this is *4.5 the budget deficit. If only we in the UK were so lucky. No-one seems to think that matters. Something amiss there with the billions and millions. However my intuition approves the 12% of GDP figure, and it is probable that this assessment does not include a lot of stuff that I would. Ted, you are so right. It is indeed $176 million, as the headline said above from The Australian all along. I’ve corrected my headline/ text. Darn. I am very distracted at the moment with other non-climate issues. Almost doing another full time project. I look forward to being able to write during normal hours again sometime soon, but it may be a few weeks before I can. Sorry, Jo. My Oz, delivered Saturday morn, says billions. So does mine, on page 2 ‘Analysis by the IPA has shown that red tape costs $176 bn in foregone economic output,’ Mr Breheny said. My own POV is that Westpac is interested in its 60% mortgage holders and has not the capital to put into a big mining project, nor with its gearing can it afford the risk. So it uses Green Credentials to cover its weakness. There will be no problem for Adani to use Chinese,South Korean and Japanese banks to do the job. with great, more than competitive benefits. Were I running one of these wealth-creating businesses, I would be sorely tempted to just shut down operations, retire the workforce, and settle down to a quiet life, elsewhere. I would also encourage others to do the same – it would be interesting to find what the professionally-offended could protest about, next; what excuses the politicians would try to churn out; what people would do as society crumbles around them. It would be an interesting experiment, as people find out that the industries that they are so willing to vilify are actually so much of a necessity to maintain the life that they are so accustomed to. Industry in Australia has been decimated due to all government getting way too big inflicting overbearing bureaucracy on any that tries to do business in this country, combined with open boarders styled trade policies its little wonder confidence in growth is cynical at best. If as you suggested occurred I would guess a series of retirement taxes and levies would be imposed on them until death until assets grabbed by retired death taxes dries up then those that are easily offended are absorbed into whatever totalitarian system evolved during the era of whinging and doing SFA. Ill-liberal variations on the broken window fallacy. The broken window fallacy was first expressed by the great French economist, Frederic Bastiat. Bastiat used the parable of a broken window to point out why destruction doesn’t benefit the economy. Private enterprise vs governmental stimulation, who benefits the most long term? There should be a legal remedy to this. However when the court is considering taking a case, if I want to have my voice heard I need to have “legal standing” (which shouldn’t, but can mean anything depending on the political party and views of the judge). The need for “standing” is often used to prevent citizens from being heard. How is it that anyone can sue a mine or other development, all these people can join the suit? It seems that if your views are radical green/left you automatically have standing. The procedures of this bias in including/excluding needs to be addressed by Congress to correct this unfair bias. This is an indirect cost. The farce of governments demanding more gas while State governments refuse to allow even exploration is incredible. However the possibly illegal RET still takes billions in cash from ordinary Australians and gifts it to power companies and individuals for nothing. At $85 a MWhr this is $1,355,736,400 or $1.355 Bn for windmill operators and $1,305,454,820 for solar panel operators. This is a totally hidden payment in all electricity bills for the right to buy gas or coal electricity. This is not payment for electricity but a legally mandated cash payment to windmills and solar power producers. For wind, it is a cash grant for power produced but to buy the power, merely for the fact of production. In the case of solar this is a cash payment for nothing at all. It is calculated on the amount power produced over the next 15 years, power for which you may have to pay again. The users get the ‘free’ power for which you paid and income for ‘free’ power they not use and which you probably cannot use either. In both cases when and if power is produced, you will have to pay again. you paid. The private solar panel customer owns the solar panels for which you paid. Both will charge you again for the power they produce. I believe this is beyond the right of any government to legislate. Governments can raise tax which they can spend in the business of running governments or providing a service like police, education, electricity. They cannot force you to pay third parties so they can own equipment and businesses and also force you to buy from them. Having deliberately avoided both the words ‘tax’ and ‘carbon’, our Federal government has introduced by far the world’s biggest carbon tax, calculated at $200/tonne for natural gas. This needs to be challenged in the High Court. Magna Carta was driven by wrongful taxation. People under kings could see the point in pay for the cost of war, but could not see the need to just hand over cash to King John just to enrich individuals. It is still true. This huge private Green cash grab must stop. This is quite apart from the fact that windmills and solar panels are absolutely useless in providing for our basic requirements for electricity. Taxation must under the constitution go into General Revenue. This is not taxation. Our government does not have the right to force us to pay for other people’s private property, to enrich others and for no benefit to ourselves, even to our own great harm. Consider that Gillard’s appalling and ultimately useless Pink Batts Green scheme directly cost this country $2.45Bn and lives and half as much again in damage, repairs and rework. This was your taxes at work, gifting insulation to individuals who could not justify buying it for themselves. At least that gift was within the rights of a government. However we are now paying as much the Pink Batts every year to enrich windmill companies and home solar panel recipients and this is not even a tax! It is totally hidden from you and responsible for the the shutting down of Australia’s cheap, reliable power, replacing it with private windmills at our expense. The Coalition should be yelling about unfair taxation. Labor should be yelling about massive private benefit and hidden taxation. No one is saying a thing and our PM is pretending it does not exist, that it is all the fault of unscrupulous energy providers and the failure of the market. Remove the RET and the price of electricity would drop x3. Remember that this markup is only what is paid by the electricity companies. This is not what you pay. As in all business, this is doubled. You pay $5Bn a year. For nothing and enrich others. In round figures, your electricity provider pays 4c kw/hr for coal electricity, a ‘non elegible’ producer of electricity under the RET. So you have to pay 9c kw/hr for a certificate. His outgoings in cash are 13c. In business you double this and hope to make a profit, so companies would charge 26c to 40c, depending on competition and what people are prepared to pay. Of this 18c to 26c is directly attributable to the RET. Then the coal and gas producer cannot compete. The windmills take the cream of the market and you do not get this huge markup. Windmill operators can sell at many times your price and still get business. So you close, exactly as was intended by this Greenest of Acts. Now no one wants gas or coal power and you cannot get paid fairly for the gas, so you sell it overseas while Australians are paying the world’s highest prices for electricity. Can’t Malcolm Turnbull see the problem is Malcolm Turnbull? He is blaming the gas and coal producers who have invested so heavily in Australia. Both he and Shorten will drive them out of the country, leaving us reliant on absurd windmills. Even the solar panels will stop working then the electricity stops. Do we have to have National blackouts next summer for someone to ask a question in Parliament? Please bring back Tony Abbott. This is destroying our energy security, crippling our lives and jobs and turning us into a third world country, exactly as the Greens like Malcolm Turnbull intended. The world’s biggest Green tax. Lost opportunity is one thing and the spin off from the investments of others. $1000 per Australian family in cash payments to strangers to make them richer, so they can sell their ‘Green’ energy to us. political party. The silence is deafening. The RET is the problem. Well the RET is the first part of the solution. It must go for there to be a solution. They say it’s not a tax. It is a tax, and this should be stated loud and clear. RET. The Renewable Energy Tax! No, that was Krudd’s scheme. Remember, the one he got an aging and irrelevant rock star to run. The problem was aired nearly 60 years ago by C. Northcote Parkinson in his book The Law and the Profits. That is that the government first decides how much it wants to spend, then secondly how to get the money. Had they directly subsidised the (expensive unreliables)** then the sums would have appeared in the Budget and been the obvious target for continuous debate, so the RET is a way of getting money from the general public to pay for one of their projects. Similarly the NBN is “off-budget”. To get their wish list they receive help from the ‘public service’ who decide how much they want for their department. You would have to search with a microscope for any instance where they asked for less, as more money would mean more public servants to check the money is properly spent (box checking) which in turn means higher grades and salaries etc. for those calculating the department budget. And it should be pointed out that for many years anything not spent at the end of the financial year was liable to be directed elsewhere and the ‘frugal’ department penalised by getting less money in the next year. Hardly a recipe for controlling expenditure. The suggestion was that for proper control is for the Government as the first thing to decide what is the level of expenditure that the country can afford. No government has seen fit to introduce that in the last 60 years so the other ‘remedy’ seen by Parkinson was for the economy to collapse under a huge weight of debt. A modern example would be Greece. I cannot see any way out for Australia; note that the talk of ‘balancing the budget’ refers to some time in the future, after the present lot have retired, and is based on getting more taxes out of a booming economy. Since the effect in the medium term of the RET will be depression of the economy there is little hope of anything but rising debt, taxes, and a collapse. ** refers to what is sometimes called renewables. No, not my understanding. The NBN is paid by taxpayer money. Windmills are not. The NBN is off budget because it is considered a secure public investment which is owned by the state (that’s you) and which will eventually be able to repay the cost of building. This is very different. At lot of public works are like that, simply not shown in the budget of income and expenditure because it is not considered a yearly expense but a sort of long term deposit which will be repaid by government charges on public use. This is similar to building a power station or a railway or a freeway. The windmill payments are not a government tax. It is also not government money and the money received never goes near the government. The payments are between the parties who sell and buy LGCs and STCs with real money, your money and this is supervised by the government who never touch the money. So you are paying someone else directly with your money to their advantage because a third party wants more windmills without having to raise a tax or call it a carbon tax. Secondly you get to own the NBN bought with your money. You never own the windmills or the solar panels. They are owned by the recipient of your money. You will be charged for using them. One of my problems with the non tax windmill charge is that you have taxation without representation. The government is not responsible for the price of the STCs and LGCs. They are a decision by people whom you did not elect. So as they have rocketed from $20 to $90 for 1Mwhr you are feeling the huge impost as this is doubled by the fact that it is at the wholesale level. So you pay 18c per kw/hr for the right to use the electricity from public power stations which you paid to be built. This money goes to strangers who are not the government to build their own power stations and force you to buy their power at whatever they nominate, which will climb rapidly as cheap coal power stations close. That was the plan to destroy manufacturing and industry and coal and gas in Australia. It is a plan which is working beautifully, especially as most Australians are unaware of it. They think the electricity people are ripping them off! About $3Billion of this cash goes overseas every year. Lucky us. One of the serious problems with the NBN is that the charges required to repay the perhaps $60Bn Stephen Conroy has spent will never be recovered by reasonsable charges. People will just refuse or at least try to refuse. At some stage a government has to have the courage to admit this. No government wants to do it, so it will probably be wrapped up in a never ever loan like the $100Bn for the four desalination plants and endlessly extended. A bit like a teenager spending tens of billions on a credit card. Just never tell anyone. Even without this, the Federal government is borrowing $1Billion a week overseas. Unbelievable. There was an old saying ….. if you owe the bank a million, you’re in trouble. If you owe the bank a Billion. the Bank’s in trouble. TdeF. The NBN is just a tool in a much bigger play, to bust the capitalist system. I will copy below a page I have written on the matter, Jo may or may not deem it relevant here. The whole truth was ever too long a story. Few have the patience to tell it. None the patience to hear it. But this is what I saw from the back blocks. The NBN is part of a much bigger scheme that has been ongoing for many years. I’ll nominate a date during the term, at the election of the Hawke/Keating government, and start a very brief summary from there. 1. The Hawke government deregulated the banks. 3. Every prudent businessman knew that what was being done must lead to a bust. Yet three of our Big Four banks joined the party. 4. In 1987 the Marxists got their bust. Just as a developer buys a building and demolishes it to build another, their plan is to destroy the capitalist system to replace it with another of their choosing. While in 1987 expectations were high that we would return to 1930, the Marxists were outsmarted. The people on top of the pile could still remember the 1930s. There is but little fun to be had on top of a pile that is flat. So instead of extracting every pound of flesh, they took losses sufficient to ensure that the pile did not collapse, leaving them still on top and the Marxists still on the outer. 5. Having failed to gain control in 1987, the Marxists took to running up public debt. Public debt must be funded by private capital. Public debt is private capital already spent outside of private management. 6. The first major economic announcement by the Rudd1 government was that: “Howard has let the inflation genie out of the bottle”. AThis was a bare faced lie. So what’s the real story? It has to be that the new government intends to engage in inflationary policy and blame the inflation on Howard. They intended to go on a spending spree, to promote public debt. And they started doing this, but then came the GFC, which enabled them to double their splurge. 7. All of this got overtaken by a phenomenal boom in mining. So we have not yet seen the disruption that their mad spending would otherwise have brought us. 8. Which brings us to the NBN, a very different business, with the same objective. The NBN is a massive project. It was foisted on our construction sector at a time when the sector was fully employed servicing the mining boom. And the NBN was set up ostensibly to provide a service that was already being developed in the so called free market. Competing in this marketplace for resources, the NBN is maximising not only its own costs, but also the costs of every other construction job being undertaken in Australia. I put it to you that this was the primary objective of the Rudd/Gillard government when the NBN was established. To further destroy private capital. This is why no cost/benefit analysis was ever undertaken. There is a sufficient number of bizarre features about the NBN to support this assessment. e.g. To set up a massive publicly owned corporation to operate in the same space as another massive publicly owned corporation which they had been trying for twenty years to sell off and had sold off almost half was downright evil. I simply wonder if anyone could possibly read and digest a 22,000 page environmental impact statement, let alone fully assess every aspect that it covers. To do that would require a significant team, a team that is well versed in the issues. Exactly where do these people come from? Presumably this would be done by the same consultants who wrote it, or at least the same consultancy firm. Nice double-dipping if you can swing it. The underlying problem is that Malcolm’s Liberals represent no one. As Tony Abbott said with the destruction of his Direct Action program, since when does the Liberal party dump its own policy and adopt Green policy? Andrew Bolt is now quoting Geoffrey Greene who was Liberal Party state director in both South Australia and Queensland. There is only one Green in the democratically elected House of Representatives, one from 200, the avowed communist Adam Bandt. However Green Turnbull, the man who crossed the floor against his own PM on carbon tax, is getting his Green way. It was a Coalition government which introduced the RET in 2000. It is a Coalition government in NSW which is banning gas and coal. It is a Labor government in SA and Victoria which are banning everything from logging to gas exploration and tripling taxes on the coal on which the state runs. Now Turnbull is blaming the very investors in energy regardless of sovereign risk and the loss of investment, ignoring the Liberal party and its supporters who are ‘deplorables’ and ‘deluded’. His assault on investment in Australia is a double whammy coupled with Green lawfare. Who benefits from this? Does super rich Turnbull really care as long as the Greens say he is wonderful, even if no one votes for him? All for political power, self aggrandisement and d*mn the people. This cannot stand. At least the Nats are still up to speed. ‘Barnaby Joyce has been called “irresponsible” by one of Australia’s most senior conservationists after the Deputy Prime Minister dismissed wetlands adjoining Adani’s Abbot Point coal port as little more than a “duck-shooting pond”. A man-made duck shooting pond, actually. But if you look at the PM’s recent effort to force the multinationals to give the Australian people a plentiful supply of cheaper gas, then our supreme leader is closer to Karl Marx. We have a great local charity that gives 100% to those that really need it, for the past year they have been trying to get another two vehicles on the road to help more over a larger area, everything has been done to ensure success, registrations, roadworthy, food handling certificates/licences, police checks, working with children etc etc…. BUT it hasn’t occurred because A: the council denies there’s any homeless in Ballarat and B: the exhaustive Red and Green tape imposed on any activity regarding public movement, personally I think this is exactly what bureaucracy was designed for to protect the political interests of those that wish to take and not give, sometimes I don’t recognise my country anymore. The headline says $176B/Year but the chart heading says $176M/Year. So which is it Billions or Millions? My Oz, delivered Saturday morn, says billions a year. Ironically, some years later, within 10 metres of the boundary fence, the adjoining neighbour was legally allowed to knock over 5 or 6 of the “significant species” box trees which the supposed gliders supposedly preferred. If we had decided to proceed with the DA we still had to obtain reports from an Aboriginal authority and the Fire Brigade. Some times some things just aren’t worth it and the project was abandoned. All up, over $10,000 down the dunny and not even a peg in the ground! Based on our experience the IPA estimates would not be too far off the mark. My point is that lost output, turnover is not seen by Australians as a problem. It can be turned into jobs and that has meaning but we have high employment, thanks to massive overstaffing of the public service, notably in Brisbane, Adelaide, Hobart, Darwin and of course Canberra. The last has the highest wages in the country, while producing nothign. However the RET is straight out of everyone’s pocket. It forced Hazelwood to close despite the fact that it was able to produce as much electricity as when it opened, and forced the owners to write off a $4Bn investment including a $1Bn operation to tidy the place. We, the victims are now expecting a 25% increase in electricity prices. For what? If it wasn’t for Australia’s largely temperate climate, poor people would be freezing to death because they cannot afford power. In summer people will not be able to turn on their airconditioners as power bills skyrocket and blackouts sweep the grid. So by Green tape, Green lawfare and Green laws brought in by the major parties to please the Green senate, we are strangling ourselves. Now would someone please explain why? How much has the CO2 level gone down, or did we just pass 0.04% anyway and even faster than expected? These Green destruction of our country has to stop. It is communism pretending to be ecology. Now our ultra Green PM says he will start passing laws controlling distribution and pricing to fix a problem for which he is responsible. Who needs communists in government when you have Turnbull’s Liberals? A friend of mine is a funeral director and occasionally gets asked to do a burial at sea. Before he can do this he has to acquire from the government a “dumping permit”. No doubt the “government” makes a pretty penny from this extortion racket…. Yes, it costs about $1,000 plus lits of paperwork. And that’s for a disposal beyond the 12nm territorial limit. as A C Osborn writes, comment #13 is it 176bn or mn? That was one area of common ground Thursday, according to people familiar with the meeting, who asked not to be identified because it was an internal discussion. They described an emerging consensus that the current U.S. pledge is not sustainable — regardless of whether the U.S. formally extricates itself from the accord. The top-level officials also seemed to agree that there is no legal mechanism for the United Nations to punish the U.S. for flouting its commitment. But there are potential domestic legal implications of staying in the deal anyway, representatives from the White House counsel’s office told the group. There is some risk that if the U.S. stays in the agreement and doesn’t take actions to cut emissions, it could surface in legal challenges to Trump’s moves to roll back environmental regulations, they said. But opponents argue that Trump promised to exit, and if the U.S. is abandoning its efforts to cut emissions it should also abandon this pact, too. “Those who argue for us to remain in the agreement are essentially arguing for us to become (officially) liars,” Mike McKenna, a Republican energy lobbyist, said in an email. With respect to the Adani coal mine in CQ, note that yesterday, Westpac bank came out and said that they would not fund the Carmichael coal mine. Of note here is that Adani has never even sought a loan from Westpac for the mine specifically, even though Westpac gave loans for the loader at Abbott Point. Hmm! Why doesn’t Westpace have the strength of conviction to be fair dinkum about it, and just ask Adani to pay back that coal loader loan in full, so they can get out of coal, like they say they are. It seems it’s okay to say that they will not loan money that was never even asked for in the first place, but still make horrendous amounts of money on the loan for the coal loader itself. It’s all in the seeming. The Queensland Government (Labor) are crying out for the jobs which will be created, and the huge royalties resulting from the coal mined there, so if Adani fails to materialise, then this Labor government has a bottom line now considerably less, and in the same breath, as with all Labor, they rail against coal. It seems that hypocrisy knows no bounds. It’s all in the seeming I guess. The policy will not satisfy conservationists opposed to any new lending for coal-fired power. It leaves the door open to funding for so-called “ultra-supercritical” coal-fired power stations that operate at higher temperatures and produce fewer carbon emissions than conventional power stations. Maybe some clouds do have silver linings. Beijing has given Turnbull the green light, probably in fear of the ultra supercritical Japanese HELE becoming alll the vogue down under. Realpolitik. ‘The Turnbull government has had a significant win for the ­future of investment in modern coal-fired power stations in Asia and Australian exports by ­getting the $100 billion Asian ­Infrastructure Investment Bank to drop its ban on financing coal-powered electricity generators. some of the fun at Harvard’s Climate Week. ***shouldn’t the first quote of McCarthy’s be causing OUTRAGE on social media? Speaking at Harvard this week, former EPA administrator Gina McCarthy urged an audience of climate scientists and health experts to stop sulking over the Trump administration’s anti-climate-science stance, to get to work, and to speak out. The president’s executive orders will have little effect on environmental rules that have been finalized, McCarthy said, as undoing those rules is as time-consuming as proposing them. In addition, she said, regulations that have been supported by sound science in the rule-making process can’t be undone without opposing science — and, if presented, that science will have to be explained in court. The day before his 100th in office, Trump took his step Friday toward dismantling a key part of Barack Obama’s environmental legacy. Legal experts say the law has never been used by a president to remove protections, just to create them. “The statute doesn’t allow that. It allows the president to put land within a protected zone but says nothing about allowing president to take it out,” said Rob Verchick, an environmental law professor at Loyola University in New Orleans. Only a lawyer would argue that. The presumption that you can undo what you have done is common to all human activity. You can legislate anything and remove that legislation. Not have a provision which allows you to remove from a register what you have put on a register is absurd. Otherwise every law in the land would be twice as long but arguing about silly points is what lawyers do, as long as someone is paying. Laws should reflect the values of a good constitution where they can be changed to suit a developing society, the Founding Fathers wouldn’t have dreamt of massive electrical generation or motorised transport but the fundamentals of democracy gives the majority a power to alter for the greater good. Yes, but the primary democracy, England does not have a constitution. It is not a republic. While Australia has a constitution, it is still the body of parliament made law, judge made law and common law precedent which drives our courts. The High court is ultimately a brake on parliament, or politicians would run riot. I believe the RET, proposed by Howard in 1997 and made law in 2000 has been modified and modified to the point where it is out of control. I also believe it is fundamentally flawed and possibly illegal and unprecedented. It is not a tax but you have to pay anyway and it is not a service the government provides. Forcing the public to pay strangers for things they do not need is wrong. For all the thousands of Green cases, perhaps just one in the High Court to challenge the RET? Lawfare is unfortunately the tool of rich Greens who use it to frustrate the wishes of the majority. I am still hoping the Malcolm Roberts raises this in the Senate and he could bring a case using the power of the Senate and the funding. It is a simple question. Is the RET legal? Is it unprecedented? Is it within the power of the Australian government or any government to order one person to pay another for something they do not want or already own, such as power from a coal power station? The Norwegian Barents Sea could hold 2.8 billion standard cubic meters (scm) oil equivalent (17.6 billion barrels), including 1.4 billion smc to the southeast of the Svalbard archipelago, the country’s oil regulator said on Tuesday. Greenpeace said the NPD’s decision to publish estimates for the areas further to the north undermined a long-standing political agreement not to drill in ice-covered waters and put pressure on Oslo to open the area to oil companies. The Norwegian Oil and Gas association, an industry lobby, however, said the new estimates increased confidence about future activity in the Arctic, which could benefit local communities and add jobs. While exploration has taken place in some parts of the Barents Sea for more than 30 years, only the Goliat oilfield and the Snoehvit natural gas field have so far begun production. The NPD said separately it expected a record number of exploration wells to be drilled in the Barents Sea this year. All the wells are in areas free of sea ice thanks to the warm Gulf Stream, with sea and wind conditions similar to the North Sea, and some 400 km (250 miles) away from the “ice edge zone” – where at least 10 percent of the sea is covered by ice. Rich and comfortable environmentalists want the world to run out of fossil fuels, no matter how much suffering is caused. We have that in Australia. The South Australia is a study in how to ruin the state to achieve nothing at all in CO2 levels, just because some people think it is a good idea for reasons they cannot explain. If you cannot lower CO2 or even stop the steady rise, why punish the world? As they sit in their living rooms reading by candle light in winter, they can thank their Premier and Energy Minister. His policies mean the U.S. could release billions more tons of greenhouse gases into the atmosphere in the coming decades compared with what Barack Obama envisioned. Instead of falling, Rhodium’s projection estimated that Trump’s policies, if fully implemented, will cause U.S. carbon pollution to continue more or less at current levels. That means that by 2025, according to POLITICO’s analysis, the U.S. would be pumping 900 more megatons of greenhouse gases into the atmosphere each year than under Obama’s most ambitious target. Through 2030, the cumulative gap between the Trump and Obama policies could exceed 4 billion metric tons of carbon dioxide, based on Rhodium’s estimates. Still, some advocates for deep cuts in carbon emissions, such as Mann, hold out hope that Obama’s policies will prove difficult to uproot. They’re counting on the courts and resistant federal staffers to stall Trump’s plans. “Bureaucracy can be both a good and bad thing, depending on the circumstances,” Mann said in an email. “In this case, I think it may save us. What puzzles me is his belief that CO2 stays in the air indefintely, or in the ocean. The fish would want to disagree. The exchange between air and sea is massive and rapid, turning over half the CO2 every 14 years. You would think he would look into the basic physical chemistry of gaseous exchange. Or does he have another agenda? But those who attended the meeting said there is a growing consensus among the advisers that the United States can’t stay in the deal unless it negotiates new terms. While it would be difficult, if not impossible, to renegotiate the Paris deal that won the backing of nearly 200 nations in 2015, Trump administration officials are increasingly discussing leveraging the uncertainty over the U.S. position to boost the White House’s policy priorities in future discussions. If the administration can’t extract new benefits for the U.S., Trump is willing to pull out of the deal altogether, officials said. Expect a protracted fight: The order is going to trigger a flurry of lawsuits from the environmental community and the biggest fight might be over any effort to undo Obama’s use of a little-known provision in the Outer Continental Shelf Lands Act of 1953 that permanently placed much of the Chukchi and Beaufort seas north of Alaska and several portions of the Atlantic coast off limits, Ben reports (LINK). I’m in the People’s Republik of South Australia right now which is a plastic bag (and electricity) free state. It is so primitive having to purchase plastic bags if you go shopping or bring your own or manually carry your items. In Victoriastan we still have plastic bags although the Left are trying to do away with them. I reuse my bags as garbage bin liners or return them to the supermarket bag recycling bin. In SA they have to buy bin liners so nothing is saved, it’s just that your expenses have increased. But remember plastic bags make unicorns cry. How do you know that? I had a unicorn once. Never went shopping with it. Can you have two unicorns, or is that a contradiction? Or a cow. he PC also caught environmental groups exaggerating the damage caused by bags (perhaps not surprisingly). I like it when people mention the fact that South Australia is now “plastic bag free”! My sister, Sandra Kanahs, was instrumental in achieving this law in SA and I am very proud of her for it. She won some environmental awards in the 1990s. This article tells the story on the first day the law came into effect, 4th May 2009, coincidentally our mother’s birthday. By the way, Sandra is also a climate sceptic. Perhaps they take the M&Ms out of the plastic bag before they leave the shop. Yes I know, but I was deliberately using David’s phrase. At the time I wondered about all the other plastic bags needed to put fruit, bread rolls etc in. They are still available. The law only applies to plastic bags which used to be provided at the checkout. That was what drove my sister batty when she started her program at Millicent Foodland about 25 years ago. Now there are NOT more than two billion such bags deposited in rubbish tips in SA each year. This time last year I was in Boston, USA and once when visiting a 7/11 store late at night I was approached by the store manager who asked me if I intended to pay for all the items I was placing in my cloth shopping bag as I walked around the aisles. Taken aback slightly, using my best Aussie accent I said this is how we do it back home and he said “I’ve had heard that”! impose this huge inconvenience on others. Same applies to any individual that wants to stop using fossil fuels. They are welcome to do so themselves but have no moral right to impose this huge inconvenience on others. David, Welcome to South Australia! Many new laws are for the benefit of the community, eg compulsory use of bicycle helmets, reduction of speed limits from 60 kph to 50 or 40 on secondary roads and quiet suburban streets, compulsory 10c deposit on drink containers which attract the GST. Someone originally began campaigning for these laws. Did they also have no moral right to do that? Sandra started her project before anyone had heard of Al Gore. If you read the linked article you will see that mum made over 800 cloth bags with her sewing machine for people to use. She wasn’t paid anything. All the family used them and they were distributed to participating stores for people to use. In the early days my sister was written off as a “crackpot” but she perservered. It took over a decade for parliament to be convinced that it had merit and became law. It’s no *huge* inconvenience at all, just a little adjustment. No-one is asking for the law to be repealed. I agree with your sentiments on fossil fuel whingers and the like. I had not read any of Weekend Unthreaded before making the above reply. 26 Apr: World Economic Forum: The ethics of solar panels: do the ends justify the means? Is deep sea mining worth the risk? However the mere presence of such resources, or the wind turbines or electric car batteries that rely on scarce materials or risky industrial processes, raises an interesting question. These are useful low-carbon technologies, but do they also have a requirement to be environmentally ethical? There is often the perception that everyone working in renewable energy is a lovely tree-hugging, sandal-wearing leftie, but this isn’t the case. After all, this is now a huge industry, one that is aiming to eventually supplant fossil fuels, and there are valid concerns over whether such expansion will be accompanied by a softening of regulations. We know that solar power is ultimately a good thing, but do the ends always justify the means? Or, to put it more starkly: could we tolerate mass production of solar panels if it necessitated mining and drilling on a similar scale to the fossil fuels industry, along with the associated pitfalls? At some point mining operations in search of solar or wind materials will cause damage or else some industrial production process will go awry and cause contamination. This may be the Faustian pact we have to accept, as the established alternatives are far worse. Unfortunately nothing is perfect. Umm, as long as they only dig it up by hand that is! The Dirty Side of a “Green” Industry (solar). Many of the solar panels that now adorn European and American rooftops have left behind a legacy of toxic pollution in Chinese villages and farmlands…………..
multiple links. “climate scientists” “angered scientists” – hyperbole, what? Stephens has also been defending his position, telling Vox that he was “not a climate denier” but he still had doubts about whether a warming trend would continue. After learning of the hiring of Stephens, climate scientist Professor Michael Mann, of Penn State University, had initially given the New York Times some breathing space. But he later took to Twitter to say that the NYT’s subsequent defence of the controversial hire had pushed him to cancel his subscription. how many subscriptions has Nature lost due to its CAGW advocacy? With a politically tumultuous spring and the window on keeping global average temperatures below 2 °C above preindustrial levels closing, environmental advocacy perhaps has a more important role now than ever before. Perhaps the bigger question mark hovering over the act is what would qualify as replication. Many datasets are essentially not reproducible in practice: consider satellite data for a given period, or experiments over extended periods of time that are financially and logistically prohibitive to repeat. So perhaps only the data analysis must be replicated — but then to what degree of similarity must the findings correspond? Indeed, politically controversial findings that have repeatedly passed the test of replication, and moreover verification using alternative methods, have remained contested at a political level: the ‘hockey stick’ graph — showing how high recent temperatures are compared with the past 2,000 years — is perhaps an exemplar. Environmental advocacy and education at this politically tumultuous time is certainly needed to keep the climate and environment front and centre in the minds of the public and their politicians. The world’s largest oil company has rubbished fears that a shift to low carbon sources could mean over a trillion dollars worth of oil assets are left abandoned ahead of the planned market float of Saudi Aramco next year. Amin Nasser, the head of Saudi Arabia’s state energy giant, told a Paris conference that global demand for oil will continue to grow for the foreseeable future because the transition to new energy technologies, including renewables, will be “long and complex”. Mr Nasser said while the short-term market points to a surplus of oil, the supplies required for the years ahead are falling behind substantially because long-term investments are not being made. Renewable energy has broad bipartisan support. The shutdown of coal is a different story. There are no popular solutions for the ugly end of climate action. Can we thread a needle through the ever-shifting ethical challenges of surgically removing a technology that still forms a major part of our society? The recent shutdown of the Hazelwood coal-fired power station isn’t Australia’s first coal closure, but the event activated the denial of coal’s inevitable demise in those tasked with forward thinking. This pattern of denial is a haunting forecast of what we’ll see when the closure of coal intensifies in Australia. Coal’s destiny isn’t a secret. The European Union has pledged no new coal plants after 2020. There is really only one way out of this: ditch the denials, accept reality, and make a serious plan for the inevitable demise of coal. ***what world does Ketan live in? KetanJoshiWebsite: I did a science degree at Sydney University, and since I was a teenager I’ve loved science, technology, philosophy and psychology. I worked in the renewable energy industry for six years, doing operational monitoring, data analysis, community engagement and corporate communications. The case, filed in U.S. Bankruptcy Court for the District of Nevada, shows the California installer has liabilities of up to $10 million, owed to up to 5,000 creditors. The dispute arose over planning permission for a six-turbine windfarm and other developments in the townlands of Derragh, Rathgaskig and Ballingeary. AN APPLICATION for 22 wind turbines in Barrhill has been sent to the Scottish Government for further discussion. The information that was presented at last week’s Planning Panel was to construct and operate an 80WM windfarm, 5.5km south-west of Barrhill, holding a height, almost, of 150m. Council candidate Bill Grant, said: “I am very worried about this proposal because South Carrick has an absolute mass of turbines now and this area is one of the few open spaces left. Candidate Hugh Hunter said: “I agree with my colleague, the whole landscape is changing. It is not the natural look of the landscape and I don’t think this area is set out to have that on it. Ahead of the meeting Kate Ashbrook, general secretary of the Open Spaces Society, called the development “damaging”. CAMPAIGNERS are celebrating after a controversial plan for three new wind turbines was withdrawn a day before a final decision was due. However the plan, which had attracted almost 1,400 objections, was withdrawn from the planning process. Planners had received 904 letters and a 387 signature petition against the plan as well as 556 letters of support. Plans for an eight-turbine wind farm in eastern Berwickshire have been rejected by members of Scottish Borders Council’s planning committee. LE 20 Ltd wanted to erect eight 100-metre-high turbines on land north of Howpark Farmhouse near Grantshouse. Officials had recommended approval, but there were a number of objections to the scheme. Councillors turned down the application claiming the area was already “saturated” with turbines. Castlecomer councillor, John Brennan, was one of those who objected to the plans. Checkout this unbelievable crap from the csiro and this marxist outfit “Energy Networks Australia”. Future energy: CSIRO gallops to the rescue………….. Carbon price? Low carbon existence? We are carbon lifeforms! Our whole world revolves around Carbon and Carbon dioxide and they want to have a minimum carbon existence? 98% of all the CO2 is in the oceans anyway. Perhaps they could point to some positive benefit for Australia or Europe and America for the 250, 000 winmills and the $1.5Trillion a year. Or have the windmills caused the pause without changing CO2? Unless I misread, the CO2 just passed 0.04% anyway and ahead of predictions. Is there no discernible effect from 250,000 windmills, or don’t they make a jot of difference. So what exactly was the point of building all those windmills? Masochism? Or is someone getting very rich from making all this up? What a load of unmentionables. Is that what South Australia has now? Low-cost? Reliable? Smooth? How much has the CO2 gone down in South Australia. This excerable waffle is unbelievable. Yes, that utter nonsense struck me forcibly too. What a load of rubbish. Low-carbon indeed! Whatever do they think we are made of, what we eat, what we breathe out? I feel so frustrated by the sheer wilful stupidity of it all. I realised in the early stages of the climate scam through reading Agenda 21 that ‘Low Carbon’ essentially relates to people and their existence on this planet. A good overview of Agenda 21, Agenda 2030 and now Vision 2050. is covered in Technocracy news and trends. Power was switched off to 90,0000 properties on the hot February evening when heavy use of air-conditioning meant demand outstripped supply. But the report from the Australian Energy Regulator found AEMO underestimated the high level of demand and overestimated power output from wind generators. “More accurate forecasts of both demand and wind generation may have led to earlier market signalling of a shortage,” the regulator’s chairwoman Paula Conboy said. As an IPA member for a few years, I have written to John Roskam, head of the IPA. I have asked him to look at the say $5Bn a year paid to third parties for a capricious certificate price for which we receive not a kw of electricity. I believe no government in the Westminster tradition has the right to order such payment. It is not a tax and they can only raise taxes. Government utilties can also fine you and ask you to pay for services. They do not have the right to force you to pay people for nothing at all. Worse, for the right to buy electricity from someone else. I hope to post his response. After reading the IPA text on Magna Carta, it is about time the Australian taxpayer said this is not even a tax and it is not within the powers vested the Government in the Constitution of Australia to force us to pay strangers for nothing at all. Of all the Green taxes, we are paying the world’s highest Carbon tax and it is not even a tax. Australian politicians, not every single one of them but far too many, have lost sight of why they are members of parliaments. They should be the elected representatives of constituents in electorates looking after the best interests of constituents, state business and national business of governments. What TdeF has commented on is the tip of an iceberg of examples of how our politicians behave like they are our masters rather than being our (public) servants. 28 Apr: Dr. Roy Spencer: People’s Climate March on Saturday — through Snow!? I’m sure the warmth in DC will be pointed to as evidence of global warming during the march. Saturday’s forecast high temperature of around 91 degrees is 20 degrees above normal for the date and around 30 degrees warmer than the previous Saturday. It would be hotter than a typical afternoon in mid-July, when the average high is 89 degrees. Should Washington hit 90 Saturday, it will be 19 days ahead of the average first 90-degree day (May 17) and the earliest first 90-degree day since 2013 (on April 10). Record-Breaking Heat Possible for Climate March on Sat. Shortly after the Abbott Coalition Government took office in 2013 they announced a list of non government organisations that would no longer be funded, the climate change office run by Tim Flannery was on that list. The government stated at that time that they had a number of others under consideration to lose taxpayer funding. Many government regulations were abandoned too. On Anzac Day an Australian born in Somalia who was brought here as a baby who is now in her mid twenties was rightly criticised for making a comment attempting to score a political point. She is a casual ABC employee (according to ABC management) and a member of the government’s Anzac Centenary Working Group. She is also on a number of other government funded groups such as the Council for Arab-Australia relations and was sent on a taxpayer funded trip to Middle Eastern countries as our ambassador. My point is about non government organisations, the cost to taxpayers (federal budget) and why are they necessary. One example is the Arab-Australia Council, we have a Department of Foreign Affairs and diplomatic missions around the world. The population of Australians from Middle East countries is quite small. So why spend extra taxpayer’s monies? The Human Rights & Equal Opportunities Commission is another example of government department duplication and it has a Tribunal that effectively acts like a court of law but does not have the powers of a court to enforce its judgements. My understanding is that this Commission is based on the UNHCR. But Australia has laws covering human rights? Green tape, red tape, non-government organisations, foreign visits, all government/taxpayer funded. The federal government (and state governments too) have spending problems, budget deficits and debt with interest to pay. This duplication and political favouritism has to stop. In the mid 1990s I was at the end of my time in the resources sector. By then I was full time trying to stem this bureaucratic tide. It was the biggest impediment to continuing mineral exploration and in mining, the ominous signs of Sovereign risk were growing. Our pulp and paper sector had been through the mill, or more accurately, we had fought to get the $2b Wesley Vale Mill up and running. Tasmania still needs it today. What does it take to deal with the paperwork mess? The most sever I got was to take the then Federal Minister for the Environment to Court. We has numerous mining leases granted by the Commonwealth, in the East Alligator region of the NT. As we tried to work on them, we were met with increasing interference and delays. We had to be careful because we were in the process of getting the Ranger uranium mines into production, again with opposition. The Environment minister finally engineered the intention to have Stage II of Kakadu national park (where these leases were, before it became a park) to be inscribed on the World Heritage list. That, we surmised, would be the end of our activity there. The nearby mine was on land excluded from the park and still is, though surrounded by it. So we had mining leases granted by the Commonwealth on the proviso that we work and expend $ on each of them according to a schedule, but at the same time were being told that it was imminent that we could not do any mineral work on this land at all. The Court case went or way in the Federal Court and the party in Paris to celebrate the inscription had to be cancelled. The fury set in. The decision was appealed before the Full Bench of the Federal Court, where we lost. One of the Judges was a recent President of the Australian Conservation Foundation, but he did not have the manners to recuse himself. So, we took it to the High Court, as far as we could go, but they confessed in essence that it was a tangled web that they could not be bothered to untangle. It cost us a lot of $$$. One of my last acts was to sit down with a QC and his Barrister in training for a QC, on and off for a couple of weeks, to draft a Commonwealth Mining Act. There was no such Act then; there is still none now. The Act we drafted was 11 pages long. A vital provision was that the ownership of new minerals discovered in Australia would go to the entity that discovered them. While this seems fair an reasonable from a distance, it is clearly a loss of bureaucratic control, so it was killed by the Establishment as fast as they could go. Because, at the base, the motivation for many bureaucrats is increasing power, increasing numbers of people they can affect and employ. That is what has to change before Australia makes much progress in reducing the bureaucratic burden. It will be a long time coming, because these days the heads of major corporations have gone gutless and refuse to mount serious challenges. Worse, some of them appear to have drunk the Kool-aid, example, see the major Aust banks voluntarily refusing to fund loans to get Adani coal mine going. While the principle of bureaucratic involvement seems remote and obtuse to most people, if you have to deal with it – especially when $$Billions are involved – it is very real and very serious. Without doubt, it is a major factor in Australian unemployment, the rating of the Australian $ and in the increasing national debt. As I approach birthday 76, on reflection, one of the major lifetime changes has been the huge increase in the number of people paid to tell other people what they can and cannot do, plus the attendant enforcers. I do not know what more I can do except to give examples of what I, we, have done in the past and hope that the drivers of Australia’s economy today will pick up the challenge and go for it. One place in dire need of revision is the Education system, from top to bottom. At present, we have a crop of University Vice Chancellors and mates who are making quite inexplicable decisions about social engineering – and I have a 6 year old grandson who is bringing home from school some views on the environment that you and I would not share. It makes me sad. Geoff. The original article has the figure at $176 billion, not million. $176 million is not that much in the grand scheme of ‘things’, but $176 billion is a colossal sum that is difficult to comprehend. And a trillion is an even more difficult concept to grasp, though such words roll off our tongues (and fingertips) so readily. Here’s a revealing way to understand these numbers: If you started counting dollar bills at the rate of one per second, it would take twelve days to get to $1 million dollars. It would take 31 years to get to $1 billion; and it would take a staggering 31,000 years to reach $1 trillion! We really have no idea of how far in the hole the world is. The US has a federal debt of almost US$20 trillion, but when all off balance sheet debt is included (e.g. unfunded liabilities like public sector employee pensions) and we add the fifty states into the mix, the US has a debt that exceeds an incomprehensible $100 trillion. Time for a bex and a good lie down.